With over 1.5 million people behind bars, the United States has the highest incarceration rate of any nation after the Seychelles. A rising number are held in prisons run by private companies. Supporters say these private prisons save money. Yet a growing body of academic research suggests that while privately run facilities may be cheaper, they are worse for inmates’ rights and raise questions about business ethics. Private companies run prisons for both the federal government and 29 states. Together these house about 8 percent of inmates around the U.S., according to government figures, a number that has risen quickly in recent years. The private prison population grew 80 percent between 1999 and 2010, according to a 2017 paper. In addition, hundreds of thousands of undocumented immigrants pass through privately run detention centers each year. In the final months of the Obama administration, the Justice Department concluded that private prisons were more dangerous and less effective at reforming inmates than facilities run by the government. After a years-long review, it decided to start phasing them out. Who are the for-profit companies running prisons? The Justice Department’s 2016 decision would have affected only a small number of federal prisons housing about 22,000 inmates. These are run by a handful of companies, including GEO Group and CoreCivic, which together booked $4 billion in total 2016 revenues. In notes to investors (links above), these companies list the prisons they operate and describe risks to their businesses, such as regulatory reform. They have received some attention from Congress in recent years. In 2016, Sen. Ron Wyden, a Democrat from Oregon, introduced a bill called the “Ending Tax Breaks for Private Prisons Act.” Wyden designed the legislation to stop these companies taking advantage of some legal IRS loopholes. In early 2017, Rep. Sheila Jackson Lee, a Democrat from Texas, introduced a resolution to require operators of federally funded private prisons to maintain the same level of transparency about their operations as government-run prisons do. While Congress discusses curbing the private-prison industry, its lobbying power has caught the attention of journalists. The Washington Post revealed in 2015 that Sen. Marco Rubio, a Republican from Florida, was one of the largest beneficiaries of donations from the private prisons industry and that he oversaw an expansion of private prisons when he led the Florida House of Representatives. The companies have spent millions on lobbying Congress in recent decades. And President Trump’s inauguration fund received donations of $250,000 each from CoreCivic and the GEO Group, USA Today reported. The companies “stand to make big gains under President Trump’s tough new immigration orders,” the newspaper said. In 2016, 73 percent of beds for immigrant detention were located in privately run facilities, a spokesperson for U.S. Immigration and Customs Enforcement (ICE) told journalists. In 2009, that figure was about 49 percent. Many activists attribute the rise to legislation that requires ICE to maintain some 34,000 beds. ICE interpreted this so-called “bed mandate” (or “immigrant detention quota”) as an instruction to fill those beds, which it realized, in part, by turning to private contractors. Besides concerns about effectiveness of private prisons and prisoners’ safety, immigration advocates and some scholars argue that private companies are driving immigration detention policy in the interests of profit. 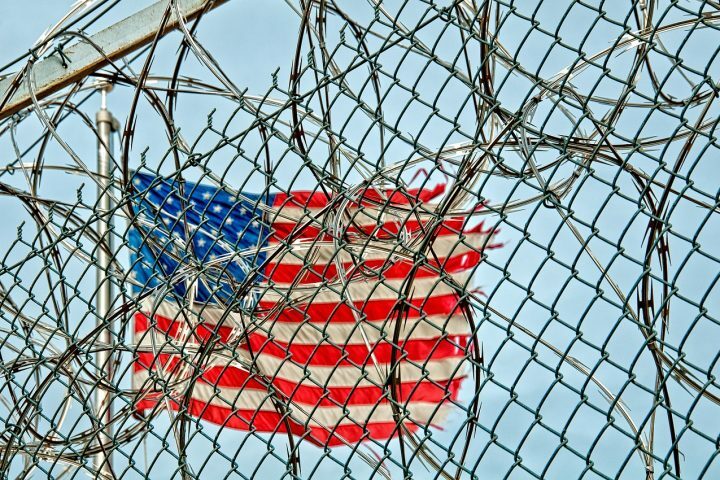 The merits of private prisons are debated not only in government. Policy wonks are also divided — often along partisan lines. Supporters, such as the conservative-leaning Texas Public Policy Foundation, say they save the government money; the companies operating them claim they are better at reforming prisoners and reducing recidivism. Others, such as the progressive-leaning Americans Civil Liberties Union, argue that they are, as the Justice Department found, less safe and less effective at reforming inmates. The research papers and law journal articles below look at different angles of the debate, including how private prisons are financed and whether they save money; inmate recidivism and effects on their mental health; how different countries have handled privatization; and concerns about transparency. Burkhardt, Brett C. International Journal of Law, Crime and Justice, 2017. DOI: 10.1016/j.ijlcj.2017.04.004. Moreno, Karina; Price, Byron Eugene. Crime, Law and Social Change, 2017. DOI: 10.1007/s10611-016-9655-1. Alonso, José M.; Andrews, Rhys. International Public Management Journal, 2015. DOI: 10.1080/10967494.2015.1048913. Saldivar, Karina Moreano; Price, Byron E. Central European Journal of International and Security Studies, 2015. Reynaers, Anne-Marie; Paanakker, Hester. International Journal of Public Administration, 2016. DOI: 10.1080/01900692.2015.1028637. Kish, R.J.; Lipton, A.F. Economic Affairs, 2013. DOI: 10.1111/ecaf.12005. Aviram, Hadar. Fordham Urban Law Journal, 2016. Headley, Andrea; Garcia-Zamor, Jean-Claude. International Journal of Humanities Social Sciences and Education, 2014. ISSN: 2349-0373. Khey, David N. The Encyclopedia of Crime and Punishment, 2015. DOI: 10.1002/9781118519639.wbecpx175. The Bureau of Justice Statistics at the Justice Department is the definitive source of data on America’s prison population. For example: When someone is convicted of a crime and sentenced to prison, he has about an 87 percent chance of ending up in a state prison and a 13 percent chance of going to a federal prison, according to the latest BJS figures. The ICE website has a section where it publishes materials that have been released through Freedom of Information Act (FOIA) requests. That includes contracts, some of which are with private prison companies. A 2016 report for Congress analyzes the benefits and costs of private prisons. The Government Accountability Office, in a 2014 report to Congress, made recommendations for how ICE can improve accountability and transparency in its detention centers (including ones run by private companies). The role of private prisons in the United Kingdom is the subject of this 2014 briefing paper for members of the House of Commons. A 2016 report by In the Public Interest, a California-based contractor watchdog, details the lobbying and campaign contributions of private-prison operators. Shane Bauer of Mother Jones wrote an award-winning 2016 expose of his four months working undercover as a prison guard at a private facility run by Corrections Corporation of America (now CoreCivic), several months before the Justice Department decided to phase out private prisons. A 2017 article in the Suffolk University Law Review proposes charter prisons as a public-private alternative to private prisons as we know them today. In our research roundups, we have reviewed scholarship on relationships between inmates and prison staff and on prisoner demographics.